Join or host a conference call from your home, office or hotel in Montserrat. Whether you're a resident of Montserrat or need to communicate with people who are located on the island, holding a global group call is a great way to facilitate collaboration with participants in other countries. With the features provided, the major Montserrat communication obstacles are removed with the Expanded Global Conference Call service. 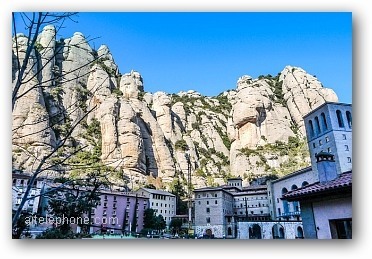 Hosting a Montserrat global conference call doesn't have to be complicated or expensive. Using the Expanded service gives everyone a user friendly access option. There are four ways to connect Montserrat participants to your global conference call. Each has it's own situational advantages depending on the attendee's phone type and whether or not Wifi is available. Using the free included Connect App with your smartphone or desktop. When you use the Connect App from Montserrat, the requirement for a local Montserrat access number is completely eliminated. Currently works with iPhone, Android, Blackberry, PC and Mac. 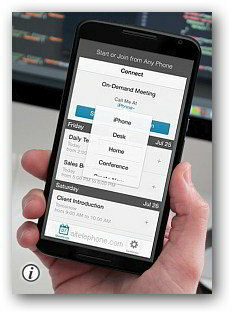 Simply download the free App and gain access to your conference call without dialing any access numbers. Have the chairperson use the dial-out feature to add the Montserrat conferees to the call. The moderator or chairperson can easily connect a Montserrat attendee to the conference call by using the dial-out feature. The participant located in Montserrat simply answers the phone when the chairperson dials his/her Montserrat mobile or landline number. The call to the Montserrat attendee is an 'inbound' call to the attendee from the account owners conference account. The attendee does not need to dial any access numbers from Montserrat, they just answer the phone when it rings and they are connected to the call. Have the 24 hour operator connect your Montserrat attendee for you. You can talk to a 24 hour operator by using your phone keypad. Dial  zero-zero. 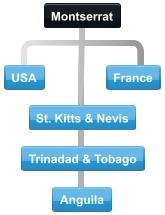 The moderator or chairperson can ask the 24 hour U.S. based operator to connect the Montserrat party to the conference call. Supply the operator with the Montserrat phone number. Have the Montserrat attendees dial the U.S. toll access number to join your call. The caller in Montserrat makes an international call to the U.S. toll access number -included in the list of global access numbers. The Montserrat attendee will probably need to pay his Montserrat service provider or mobile phone company a rate to call the U.S. Or Skype dial-in would be another option. Our international conferencing service directs your attendees over a global PSTN network for exceptional call quality. This is a pay-as-you-go global conferencing plan with no setup fees, no minimum usage requirements, no contracts, and no penalties. Simply hold international conference calls as needed, and pay only for the minutes used. Montserrat is a British Overseas Territory located in the Lesser Antilles in the West Indies. This Caribbean island is only about 10 miles long by 7 miles wide. A volcanic explosion in 1995 caused about two-thirds of the population to flee. This was just a few years after Hurricane Hugo caused widespread damage to the island and left nearly 90 percent of the island's residents homeless. Volcanic activity continues to affect the island, primarily along its eastern side. A large exclusion zone exists as a result of the volcano's potential. 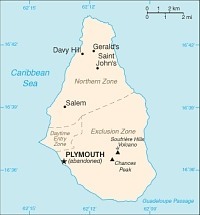 Because the volcano destroyed Montserrat's capital city of Plymouth, a new town and port are being constructed on the island's northwest coast. Though some of the estimated 8,000 refugees who fled the island have returned, not all have. As of July 2014 estimates, Montserrat had a population of just 5,215 of its pre-eruption population of 12,000. As you can imagine, losing an entire capital city, its airport and seaports, and two-thirds of its population has affected Montserrat's economy. A lack of housing makes returning to Montserrat difficult for those who want to return - with half of the small island deemed uninhabitable. There's also a lack of suitable land for the agriculture sector to replant crops. According to CIA World Factbook, Montserrat had 3,000 main line telephones in use as of 2012 and 4,000 mobile cellular phones during that same time period. Despite the island's difficulty because of the volcano, its telecommunications system is characterized as modern and fully digitalized. Its combined tele density for both fixed lines and mobile phones exceeds 100 per 100 people. Montserrat is a landing point for a fiber optic submarine cable (East Caribbean Fiber System), which provides links to other islands in the eastern Caribbean. As of 2009, Montserrat had 1,200 Internet users. The regulatory agency responsible for restructuring and integrating ICT (Telecommunications, Information and Communications Technology) and broadcasting industries to form an "Info-Communications Sector" is the Montserrat Info-Communications Authority (MICA). According to its website, MICA is charged with transforming Montserrat into "an intelligent island with the necessary and sufficient socio-economic infrastructure to accelerate and sustain growth and development of the economy." If you need to call someone in Montserrat, you will need to dial your country's international call prefix, a number that allows you to dial outside of your own country. For example, if you're in the UK, you'd first dial 00, which is the international call prefix for the UK. Next, you'll need to dial Montserrat's country code, which is 1, followed by its single area/city code, which is 664. Finally, you'll dial the provided number for the person you are calling. Thus, from the UK., you'd dial: 00 1 664 + the provided number. English Harbour, St. John's, Jolly Harbour, Turners Beach, Bolans, Saint Mary's or any other city on the island of Montserrat. Optionally the chairperson or attendee can use the web 'Connect' feature to trigger a callback to his/her phone to enter the Montserrat conference call. Four ways to connect Montserrat attendees to your global conference call. Montserrat businesses or travellers find the Montserrat Conference Call plan a valuable communications tool to stay in contact with associates in other countries from Montserrat. Toll-Free access from the U.S.